Yesterday I talked about how Henrietta Leavitt discovered the period-luminosity relation for Cepheid variable stars, and how that allows us to determine the distances of galaxies. You can see this relation in the image below, which plots the brightness of several Cepheid variables versus their period. As you can see, there is a simple relation between them. 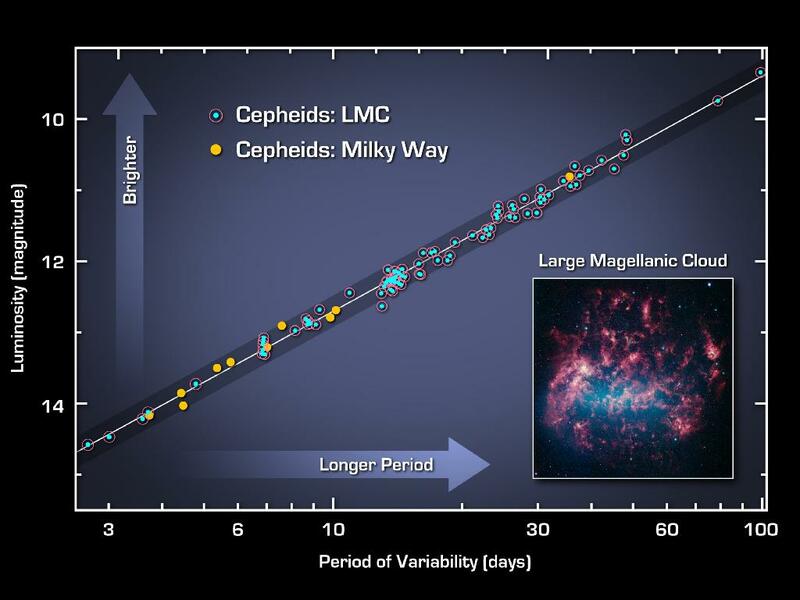 Since Leavitt’s discovery of this relation in the early 1900s, Cepheid variables have been used to determine cosmic distances. It is one of the “standard candles” that we use to determine things like the expansion of the universe. Of course you might notice that the stars don’t follow this relation exactly. Some are a bit brighter than expected, and some a bit dimmer. This means when we observe a Cepheid variable in a distant galaxy there’s a bit of uncertainty to the galaxy’s distance. This uncertainty limits our ability to understand things like dark energy. Our understanding of dark energy depends on an accurate determination of what is known as the Hubble constant. One way we can determine this constant is through the cosmic microwave background, while another uses Cepheid variables and supernovae observations. These two methods agree to within 5%, but that 5% difference is too large to distinguish between different models for dark energy. So our observations are precise enough to say that dark energy is real, but not precise enough to determine its exact nature. We now know that the period-luminosity relation for Cepheid variables is a bit more complex than originally thought. While the general relation works really well, there are small variations that depend on certain characteristics of a star. One of these characteristics is its metallicity. As I’ve written about before, the metallicity of a star is a measure of how much metal (which in astronomy means anything other than hydrogen and helium) a star contains. Recently, a paper in Astrophysical Journal looked at the dependence of Cepheid variables on their metallicity. To study the metallicity dependence on the variables, the team couldn’t use the period-luminosity relation to determine galactic distances, so they used a different method known as Tip of the Red Giant Branch (TRGB). The TRGB method looks at the brightness of the brightest red giants in a galaxy at infrared wavelengths. It turns out that bright red giant stars have an upper brightness limit at infrared wavelengths, so it is an alternative to Cepheids for measuring galactic distances. The team compared the TRGB distances for several galaxies with the Cepheid distances, and then looked at the metallicity of the Cepheids in comparison. What they found is that the brightness of a Cepheid variable decreases slightly with higher metallicity. Knowing this will help us more accurately determine galactic distances, which may help us understand more about dark energy. Paper: Sakai S, Ferrarese L, Kennicutt, Jr. RC, Saha A. The Effect of Metallicity on Cepheid‐based Distances. ApJ. 2004;608(1):42-61.